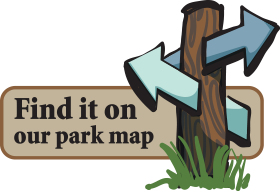 The park is also handy if you are seeking outdoor adventures. If water recreation is what you desire, State Park Marina rents everything from ski boats to paddle boards and offers all the supplies you will need for a day on the water, whether it is a relaxing day of fishing or an exciting day of skiing. For land-based activities, take a hike or go for a bicycle ride on a paved trail or a challenging mountain biking trail. The park is also a popular resting spot for those wanting to take in the area attractions. Located among oak and hickory trees, basic, electric and sewer/electric/water campsites wind along the shoreline of the lake. Visitors can also stay in the premium yurt. Just coming for the day? Numerous picnic sites are scattered near the lakeshore. An open picnic shelter, perfect for family reunions and get-togethers, can be reserved by contacting the park office. Although there is not a designated beach, you can swim in several areas of the park. Please visit the State Park Marina website for a complete list of hours for these locations. The park office may be open additional hours as staffing allows.